Time for a footpath parking campaign? trying to take up less space on the road, perhaps trying to give other drivers more space to reduce the chance of their vehicle being side-swiped (I can’t imagine this happens often). Yet while we have campaigns telling pedestrians to be careful, we’ve never had one about this menace. 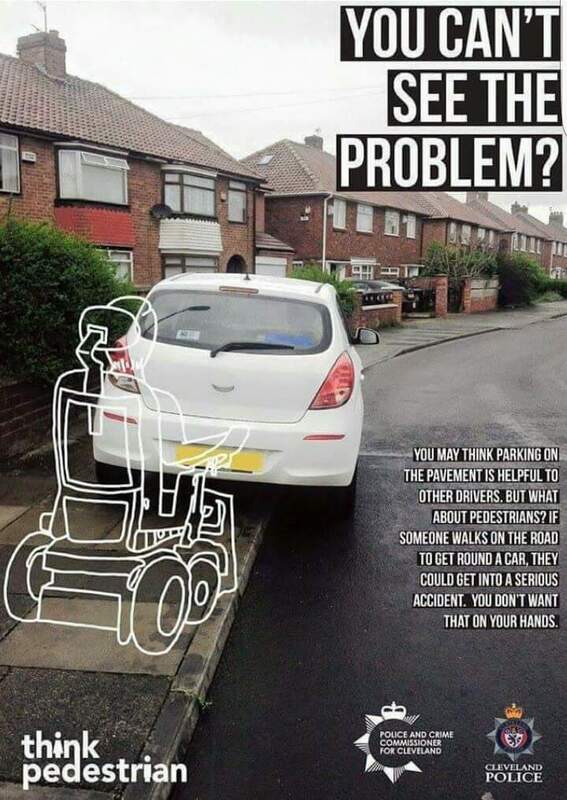 So perhaps Auckland Transport could copy this idea from the UK highlighting some of those who suffer the most from when people park on footpaths. YES, IF combined with enforcement. From anecdotal experience it is often repeat offenders (same driveway on walk to train several times a week, etc). Yes please. This behaviour is very common round my way. Motorists think they’re being considerate (to other motorists). It’s a blind spot from never walking anywhere. Yes. Absolutely, YES. This is needed for ped safety. Often they park on the footpath because they think they’ll be quick. Often because they’re “waiting” (i.e. union street outside the sugar tree and avoiding the dashed yellow lines on the road, ignoring the parking on the other side). Often they’re loading/unloading. But all these excuses are just that, and the driver often leaves when I threaten to call AT. Until there is a campaign like above, take a pic, send to @YouShallNotPath and AT, and hope the message gets through. Have an album of pics of people parking like dicks on the footpath in the CBD. It’s not just cars. There is currently a roadworks sign on the footpath on Swanson Street, taking up 2/3 of the pavement on what is a busy pedestrian route. It’s a sign to alert drivers of roadworks, so I’ve relocated it to the road way where the target audience is. Why is it such a default mindset that its acceptable to disrupt the pedestrian realm, in order to keep MV’s from driving around a cone or sign. I agree. The “street safety” contractors seem to only consider the cars. It’s blatantly obvious when they provide detailed “detour” signage around the place for vehicles, but restrict access to walkers and cycles often without any apparent consideration to them. Worse still is the brainless turning of the signs when the works are not underway. Edge on to pedestrians. Head splitting potential! Add to it the the casual ‘Footpath closed use other side’ signs with no safe method of getting to ‘the other side’ or do they mean it in a spritual sense? ie dead ped. There was one in Parnell for months a while back. Pity there wasn’t any footpath on the other side of Falcon St, only a Block wall. The temporary road signage seems out control in Auckland, the roads are “oversigned”, what eventually makes them less safe particularly for cyclists, pedestrians, and mobility scooters. That’s the way to go! Just being helpful! I tried talking to the traffic cone specialists about a blocked footpath and mowing the grass they were forcing the pedestrian’s to use but nothing happened.. Followed up with suggestion that they get onto these chaps and the road works finished without any action. How about not waste money on advertising which will end up on many deaf ears. Very much this. I don’t know if there’s much need for fancy flying squads to respond to every instance, but when parking wardens come across footpath parking during their rounds they need to be aggressive about issuing tickets. And then, when the offenders inevitably complain, AT needs to stand firm and uphold the tickets. It should just be a normal thing that people can expect to be fined for, if they are caught. one expects the same thing about speeding but still people feel highly aggrieved about being ticketed for it (even after countless advertising campaigns). If anybody remembers the Verve video for the Bittersweet Symphony (that one they “borrowed” from the Stones), there is that part where Richard Ashcroft walks over the emerging car. Perhaps this could be a peaceful action for the able bodied amongst us. Any inanimate object on the footpath, is the footpath, therefore to be walked upon. Certainly stickers should be issued so that we can stick them on the vehicles of ignorant parkers. Someone stuck an I heart Catan on my dad’s car once and it caused immense shame. I am sure something along the lines of “I am an arrogant excuse for a human being, I only think about myself, and would never give the time of day to one of those pedestrian types” would do the trick. AT should really put out an app that allows you to geocode a photo and issues tickets from video evidence. I report at least 5 cars every time that I am in Auckland but leave about 50 because it’s just too many calls to make. This. And you never know if someone will get there in time to ticket… Though, AT have been good several times when I’ve called about this. I’ve been printing these for a while now and putting them under wipers of cars parking on footpaths: http://www.livingstreets.org.nz/reclaiming_footpaths – sometimes the message gets through, but there are some stubborn offenders. AT is not serious about policing it, they don’t want photos as evidence, instead they might send a patrol car there. I proposed painting 1-2 meters of yellow no stopping lines in some places, AT responded that it’s too much effort as that would require proper consultation. I think their hands are a bit tied with legislation, so perhaps the initiative needs to come from the central government, but they don’t understand the problem… they don’t walk enough. AT do generally send a warden if you phone in a complaint. These notes are not threatening. They’re very polite! They explain exactly what the problem is with parking on the footpath. If there is a problem council should deal with it, but it sounds like a complete cop out what Wellington Council is doing… Footpaths are just that full stop. No argument. Road too small, footpath too big, then reduce the footpath. But if you set a simple rule of not parking on footpath, let it be law to the letter. This reminds me of Auckland Transport U-turn on fines for parking on footpaths last year… Tickets issued for illegal parking @ 2am… A huge uproar from residents. Heaps of excuses. But the reason for backdown is even more pathetic… because one of the parking wardens was photographed parked on a footpath. Massive fail. Takau St is the worst for me. It has a narrow footpath on one side only which is always blocked in multiple places by rubbish & recycling bins, and cars parked across it. The road itself is only one lane wide (and a row of parked cars). So this space can get crowded being shared by trucks, cars, pedestrians & bicycles. This is part of the northwestern cycle route. It’s not just this. There is in general a very strong culture here that as soon as you step in your car, you earn the right to arbitrarily annoy, inconvenience, aggravate, or even maim or kill anyone not in a car. Think of cars backing out of driveways at 15 kmph. Or kids producing 110 dB with their silly tuned cars at 2am. Or the expectation that pedestrians give way to cars in every possible situation. Those are all things you just don’t see overseas. Way I see it, we should just deem all cars parked illegally on the footpath or anywhere else as abandoned. If you dump any other bit of property on the street, it’s litter. Why should cars be different? And can we please also have a blitz on cyclists riding on footpaths? Not more of this “it’s OK to ride on the footpath because the roads are too dangerous” nonsense, please! Why should cyclists be allowed to take their frustrations out on pedestrians, who have nowhere else to go? I can just see some NZ Herald reporters getting all geared up to come to the defence of poor drivers who are rightfully pinged with a fine from any AT blitz. The wailing and gnashing of teeth. ‘Who will think of the driver? Victims of bureaucratic revenue gathering.” Same old Herald crap. Poor street design contributes this problem. Why in some urban city streets is there nowhere for visitors to park? No new developments should be build without adequate parking and concrete spaces on berms for wheelie bins. I dont think we should regulate for an increase in parking simply because some drivers don’t understand rules. Better to educate and enforce the rules we have than to try and shift the problem elsewhere. Well, we could reduce it with design, i.e. 25cm tall kerbing, bollards & fences everywhere etc, but that would add expense and streets would become uglier for it. I live in a suburban street, People often park 1/2 on the road, 1/2 on the footpath (blocking it). There was a completely legal parking space they are already occupying 1/2 of. People often park sticking out of driveways, blocking the footpath. Generally street parking spaces are fairly available on my road. Where I used to work, I have seen courier drivers park on the footpath (and drive 50+m along it to get out the next kerb cut so they don’t need to reverse, when there is a vacant, 2 space P5 “Goods service vehicle only” loading bay directly across the street. In the above situations, it is either that the drivers are unfamiliar with the law, or choose to break it deliberately, assuming (often rightly) that the chance of getting fined it low. In a lot of the older parts of town – the ones with the narrow streets, the stormwater discharge from the roofs is to the kerb by way of a shallow pipe. This pipe is often plastic and can be crushed by a vehicle parked over it. This will restrict the SW outlet and can lead to flooding of the foundations of the adjacent house. Some drivers not only park across the footpath but do so in a way that totally stuffs up the footpath – i.e. with say a metre of the car in the driveway on private land (so you cannot slip around the front of the car) and the rear on the berm crossing between the footpath and the road. I sometimes put one of the Living Streets Aotearoa calling cards under one of the wiper blades of the offending vehicle (a yellow card shaped like a human foot with the message “Don’t tread on our toes” on one side and a more detailed explanation why not on the other side. Occasionally I will even knock on the door of the property to remonstrate with the car owner but usually meet incomprehension as to why I think there is a problem. So yes, lets have a campaign, backed up by penalties to get the message through. I’ve noticed this too. I’m starting to think it’s a reflection of housing costs in Auckland. More people living together in houses for affordability sake. Means more cars in the neighbourhood. Unfortunately it usually comes down to poor road design, resulting in the road being physically impassable to vehicles when there are cars parked on both sides. Where off-street parking is intended, road width should always be wide enough to enable legal parking without impeding traffic. Many older residential streets are very narrow and overcrowded parking areas can cause accessproblems, particularly for emergency services. People sometimes park on the footpath on these narrow streets, which degrades the pedestrian amenity of the street. Emergency services have advised that they require at least 2.5 metres of clearance to allow for sufficient access down streets in case of an emergency. Narrow Residential Streets (…) 6.5 metres. Are they kidding? On a street that wide, even if there are cars parked on both sides, there’s still a 2.5 metre gap, plenty for emergency services. Drivers may occasionally need to stop for oncoming traffic. Whoever wrote that policy should travel more. Where I’m from, the typical residential suburban street is under 5 metres wide. Without any parking restrictions on either side. And I never heard about big problems for ambulances and fire engines. Maybe we should just stop building these the size of a truck. Or not Geoff. Have you actually been to any other cities?, I dunno, like Paris, or Florence, or London, or Barcelona. Great wonderful cities. With, shock horror, not always the possibility to park on both sides of every street: Imagine the horror. I’ve been following up with AT on footpath parking issues particularly around the Ponsonby end of Williamson Ave. AT has made the situation worse by allowing the Countdown developer to put in big expanses of concrete (AT has now agreed to fix one section alongside Rose Road by adding tree pits). The other big issue is motorists not giving away on driveways and private property. A lot of drivers seem to think they have R.O.W., why is there no campaigns from AT for this? I don’t walk much but almost every time I do – I almost get bowled over or raged at by people entering driveways. It really discourages walking. Also the parking on footpath issues – vehicles are a big problem but not the only one. Often roadworks signs, shop signs, shop tables/chairs, cones, sand bags, wheelie bins, skip bins, rubbish bags, trailers and all sorts of stuff that shouldn’t be blocking the way is left there – footpaths should be treated the same as roadways and kept clear at all times. As mentioned above, Living Streets have a leaflet. Here’s a photo of it in use – http://www.livingstreets.org.nz/node/2185. On the subject of driveways in industrial areas the trucks seem to think they have ROW. It is positively dangerous to walk along O’Rorke Rd in Penrose and parts of Rosebank Rd in Avondale to name a couple of areas. These driveways should have give way to pedestrian signs erected. In addition the car repair yards along O’Rorke Rd use the footpath as parking for their customers vehicles waiting to be repaired.